Pillows, blankets, your mom’s dining room chairs, and couch cushions made for pretty awesome forts. But nothing compares to the growing legacy in the City of Trees. Alefort, Comedyfort, Filmfort, Foodfort, Hackfort, Kidfort, Skatefort, Storyfort, Yogafort. That’s a whole lot of fort commonly referred to as, collectively, Treefort. Of course the Treefort Music Festival held at the end of March in beautiful, welcoming Boise, Idaho has quite a bit of music to boot. We’ve kept a close eye on the Treefort over the years and it is looking like Treefort 2018 has raised the bar with artists in all the right ways and adding a refreshing mix of new and familiar names to the festival, region, and local/independent music fans everywhere. 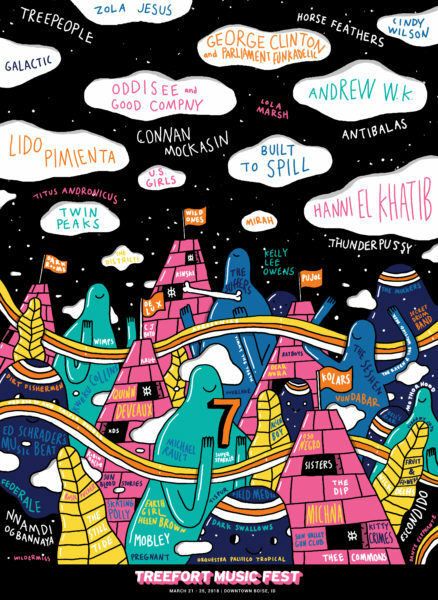 Here are the first 94 bands, including legends in music mixed amongst independent and ambitious artisans of the craft. Treefort Music Festival will take place March 21 – 25, 2018 in Downtown Boise, Idaho. Be There! This entry was posted in Interviews & Live Events and tagged 2018, Artists, Bands, fest, festival, lineup, music, Treefort by Greg. Bookmark the permalink.